For those of you not familiar with ghee, it is essentially clarified butter (butter with the milk solids lactose & casein removed). The end result is a golden yellowy/orangish butter oil that is extremely high heat stable (excellent for cooking and even frying). I was going to purchase a batch from Pure Indian Foods, but instead decided to just venture out and make my own. It was SUPER easy and a total success on the first try. strained with cheesecloth over a strainer into a bowl. Bam! 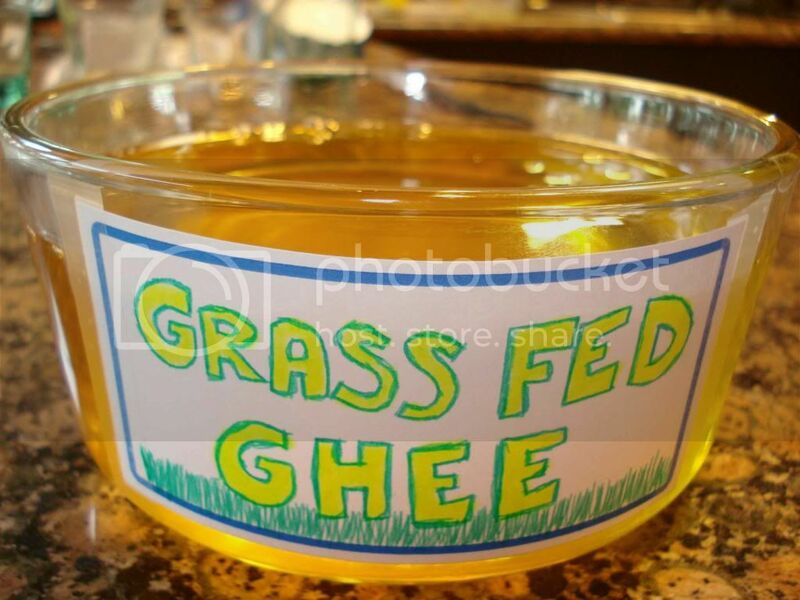 perfect crystal clear grass fed ghee. Soooo delicious and it's a huge savings to spend the 20 minutes to make it yourself. **the solids at the bottom of the pan should be 'slightly' cooked (not burnt, but light brownish). this timing is essential for the best ghee flavor. if they are still white, your 'ghee' will be more like clarified butter, very yellow. if they are black, you burned them and it may make the ghee also taste burnt. So here's my questions to all... Anyone else ever made ghee? and if so, did you use/eat the milk solids for anything or did you just toss em out? I took a bite and man it was extremely salty! Foamy milk solids removed -------------------------------------------No more bubbling - it's DONE! Cheesecloth, Strainer, Glass Jar/Bowl -------------------Pour to strain. Check out the solids in the pan. There's no need to "boil" the butter. Clarifying can be done @ low temp. But I like the whole herb idea, considering some of them are fat soluble. Thanks for the hack, now making superbutter is my number one priority. TY. Working from home today so I will give it a go! HLH. It's so easy it's ridiculous. You just throw the butter in the pan, turn it on it's lowest possible setting and let it sit for like 35-40 minutes. skim the top foam and make sure the bottom solids are brownish. let it cool for a few minutes and strain into jar. i ran out of cheesecloth so I used a paper towel. It worked fine. I'm laying off ghee for now because of some personal issues, but I still think it's a good fat for most people. http://www.ncbi.nlm.nih.gov/pubmed/2887943 "Substantial amounts of cholesterol oxides were found in ghee (12.3% of sterols), but not in fresh butter…" Ok, now the question is how much of the essential oils are necessary to reduce this. I'm afraid it's probably quite a bit, and who wants to eat the oxidized essential oils? Thanks for this Jack! I'm excited to try my hand at making ghee! The salt is supposed to go out with the milk solids. In what amounts of the above recommended herbs and spices would be sufficient enough to prevent oxidation? I think most people, including CM, think cholesterol oxides are bad. He probably think the good that comes from eating ghee and eggs outweighs that bad, and so do I. But, that doens't mean you can't get the good while avoiding the bad, does it? Ghee would taste rather delicious I think if cooked the way I suggested and the cholesterol oxides would be dramatically reduced. Yeah. It's not like you'll be eating 100g every time. Give it a go why not. hmmm. the jury's still out on this one for me. are you saying that eating ghee has been bad all these years due to cholesterol oxidation? i understand the concept and the possibility of it, but I definitely am not ready to just accept that eating a cooked egg yolk or heated butter is damaging to one's health. i'd really like to hear chris masterjohn's take on this. yah i guess if you are not allergic to lactose/casein then it should be ok to eat, right? no diffferent than adding a big spoonful of butter into a dish, which I do all the time. the solids that I skimmed off the top and discarded into a bowl smelled like delicious cheese. that's why I ask. personally, salted vs unsalted has not made a bit of difference. infact, i just made ghee with salted butter a couple days ago, and i think it was my best batch yet. it has no salty flavor, just smooth and buttery. 1) Use unsalted pastured butter to make regular ghee, salted butter will leave a salty taste. 2) The light brown fried milk solids - They are a wonderful treat if you eat dairy. Mixed with a spoon of honey, they make a great dessert, full of nutrients and very calorie dense. I used to feed them to my chickens when I had some. I know this is an old thread; but for anyone who happens upon these instructions I would like to add that I never skim the top foam off of the butter while making ghee; it will settle eventually on its own. I added the milk solids to mashed potatos first time today and the result was excellent. I'd add some rosemary, oregano, and/or turmeric before you boil the butter to prevent the formation of oxidize cholesterol. I think the milk solids taste good on their own, but are they healthy? I thought one of the main reasons people make ghee is to avoid the lactose problems people have with the milk solids. Are there any studies done on this? Also, do they need to be refrigerated and what effect does salt have on the process? I use the solids for my pilafs instead of oil or butter. You don't need to add salt obviously and the slightly brown solids give the pilaf beautiful color and super taste. I made ghee when I saw the price of the pre-made stuff, and yes, it was super-easy, but no, I didn't eat the milk solids. Btw, although I used a burner set on the very lowest setting, I know people who have made ghee in a crockpot with great success.